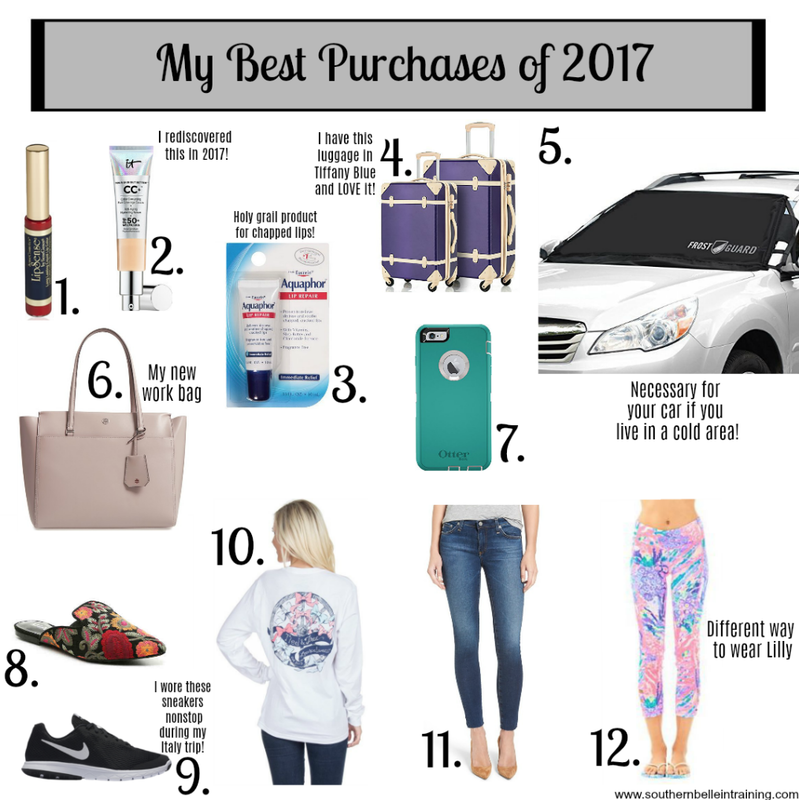 I've seen many other bloggers writing posts lately about their favorite or most used purchases from last year, and I've loved reading them! I think these blog posts are so useful and provide such honest insight into the fashion items and other products that you see showcased on your favorite blogs and Instagram accounts regularly, as well as some behind-the-scenes items. I decided to write my own post featuring my 2017 favorites. There are items in here from all different categories- I hope you enjoy! 1. LipSense: I started hearing a ton of buzz about a magical lip product that stayed put all-day around this time last year. With each month that went by in 2017, I heard more about it on social media, and some of my favorite bloggers signed up to be distributors! Last summer I had the chance to partner with one of my favorite bloggers/LipSense distributors, April from Smidge of This, to do a LipSense review here on Southern Belle in Training. To date- it was one of my highest trafficked posts of the year! Anyways, I ended up falling in love with LipSense. Not so much so that I've thrown out all of my other lipsticks or become a distributor myself, but it is a really great product. I wear it now for most of my blog shoots and my radio events, because it really does stay put on your lips so well! I've since purchased more from a local Vermont distributor as well- we had a LipSense party at my work and now all my female coworkers are obsessed with it too. If you'd like to try LipSense- here is April's business Instagram account! 2. IT Cosmetics CC+ Cream: This is something that I first tried from a PR package back in 2016 that I actually didn't love. I went back to using other foundations, but I received some more in a PR package in 2017 and decided to give it another try. Y'all- I fell in LOVE this time around! This is my new everyday foundation for work and weekend wear. It's a very natural and light coverage, and it blends beautifully. I wear the shade Light. I do wear a heavier coverage foundation for blog photos and formal events, but I am loving this for everyday wear! 3. Aquaphor Lip Repair: I struggled for YEARS with horribly chapped lips at all times of the year, and I tried so many different things that never worked. Every variety of Chapstick, Carmex, all-natural products... nothing worked! This past year I started using Aquaphor, which is sold at most drugstores. Where has this miracle product been all of my life?! It is a life saver, and under $5! 4. Merax Travelhouse Vintage Suitcases: I've gotten so many questions on Instagram whenever I've shared pictures of my new luggage, which I'm still obsessed with! After my first blogging press trip was booked in the fall, I decided to treat myself to new luggage. I own this set in Tiffany Blue (the picture above is of it in the purple color). I'm so glad I purchased this! 5. FrostGuard: This is something my mom bought for me, but it might be one of my Top 3 items on this list- not even kidding! It's a windshield guard to protect your car from frost and snow, so it's an essential if you live in cold climates. I use this on a daily basis now, and it's made cleaning my car off in the mornings before work SO much easier!! Seriously- if you live in a cold area you need this. 6. Tory Burch Parker Tote: My parents generously got me this bag for my 23rd birthday, and it's my first "big girl" work bag! I am obsessed with it. It's the perfect size to carry everything I need for work, and comfortably fits my laptop as well. I did use it as a carry on during a trip last month and I probably won't do that in the future, as the bag's shape did get a little messed up in-flight. But it is ideal for work and daily life! This is an investment bag that I'll have for years to come, and I received the matching wallet for Christmas! 7. Otterbox Defender Case: Y'all- it finally happened in 2017. One week before my move to Vermont... my iPhone screen shattered for the first time ever. (The worst part was it was a freak accident as to why it did, I didn't even drop my phone!) Anyways, that was the final straw and I realized it was time to abandon the cute iPhone cases that I loved and finally concede to getting an Otterbox. I thought I would hate it- but I actually have really liked it, and it's held up very well! I'm going to order a new one soon just because the rubber on my original one is finally starting to get discolored, but as a case it's held up extremely well and done an amazing job protecting my phone. If you drop your phone a lot or aren't careful- I highly recommend getting one of these before your phone's screen shatters! 8. Floral Mules: This was a surprising and spur of the moment addition to my shoe collection in 2017 thanks to TJ Maxx, but I ended up loving my floral mules! They were a fun twist to so many of my fall work outfits! The pair that I have aren't online, but these are very similar. Shoes are one thing that I tend to be pickier about buying (compared to clothes and jewelry), so sometimes I don't try the latest trends. I am glad that I tried the floral mule trend though! 9. Nike Flex Experience Sneakers: I was well overdue for a pair of cute casual sneakers around this time last year, and I started shopping for some before my March trip to Italy. I picked up a pair of Nike Flex Experience sneakers in black since I thought they'd match a lot of the outfits I was bringing on the trip. Not only were they super comfortable and lightweight shoes to explore Italy in, but I've worn them so much since then! I'd love to get another pair of casual Nike sneakers in a different color, but black is definitely a super practical color. 10. Lauren James Long Sleeved Sweet Tee: Lauren James has become one of my go-to preppy retailers, and I went a little crazy in their Pink Friday sale last summer. (It's like the LJ version of Lilly's After Party Sale). The most versatile things that I bought in the Pink Friday sale were stocking up on lots of the Lauren James Sweet Tees! I bought a bunch in both short and long sleeved, but it's the long sleeved ones that I love. These shirts are seriously SO cute, and they're the best to throw on when you don't want to put effort into your outfit but also don't want to look like a bum. I've worn them to work on my Saturday shifts, for running errands, for long days in airports, and so many other things! The specific designs I have all sold out in the sale but they always have tons of cute ones in stock each season. 11. AG "The Legging" Ankle Jeans: I've been hearing hype in the blogging world about AG Jeans for a few years now. Back in college, I could never justify spending a lot of money for designer jeans, so I didn't wear anything that was over $50. I finally decided to splurge and buy my first pair of AG Jeans from the 2017 Nordstrom Anniversary Sale, as they were marked down quite a bit. Oh my goodness y'all- I'm in love! They fit my body like an absolute glove and are so comfortable. They've held their softness and shape through washes as well. I am planning to buy another pair in next year's NSale, and I'm always checking my local high-end consignment store to see if they have any pairs in my size (so far no, but it's always worth looking!). 12. Lilly Pulitzer Luxletic Weekender Cropped Leggings: It's no secret that I adore all things Lilly Pulitzer. I decided last year that it was time to take that obsession over to my workout attire! I bought my first pair of Lilly Pulitzer Luxletic Cropped Leggings over the summer and was immediately obsessed. They're super soft, and the fun colors and patterns make you look forward to working out! I now have a second pair from my recent collaboration with Pink Colony for the After Party Sale, and I already know they're going to help me with my fitness resolutions! What were some of your favorite purchases or discoveries in 2017? I love seeing people's favorite purchases of the month or year, it provides such a cool peak into people's lives. I especially love that bag! Last year my (caseless) phone fell off my lap while I was sitting at Starbucks (so, like, a two foot drop) and completely shattered! I've had that style OtterBox on my new phone and I've dropped my phone on the concrete with no damage. I just bought a pair of plain black Nikes and I wear them all the time because they're so cute and comfy! I've been seeing this post everywhere too and have loved seeing what everyone else loves. Def want to try the IT Cosmetics CC cream haha. Love the tote and jeans! So glad to see you found so many products to love last year! So many great purchases! I need to get that FrostGuard for my Mom! In in the market for a new work bag and that Tory Burch tote you have looks amazing! I really love the Lily leggings and the luggage set. I can only imagine it being in Tiffany Blue! That Tory Burch work tote is gorgeous! I'm in the market for a new work bag so that may be one of my first big purchases of 2018! Thinking I need to invest in that windshield cover for this crazy VT weather! GIRL. I recently discovered Aquaphor towards the end of last year and it was LIFECHANGING! I use the regular ointment (the lip-specific one has SPF in it which gives it a weird taste to me) and it has made such a difference on my lips. I recently lost my tube and only lasted a couple days without it because my lips got so dry! I'm so glad that it's working well for you too! I love the Lauren James long sleeve tees too! I actually own a billion of their short sleeves but only two long sleeved ones...I guess next time they have a sale I need to stock up on those!